One of our favorite days of the year is right around the corner – the start of Sea Turtle Nesting Season! This 4-month nesting period begins May 1st and runs through the end of August. As more and more people flock to Wrightsville Beach and Topsail Island, it’s now more important than ever to be aware of exactly what this means if you have any plans to hang out on the North Carolina beaches this summer. 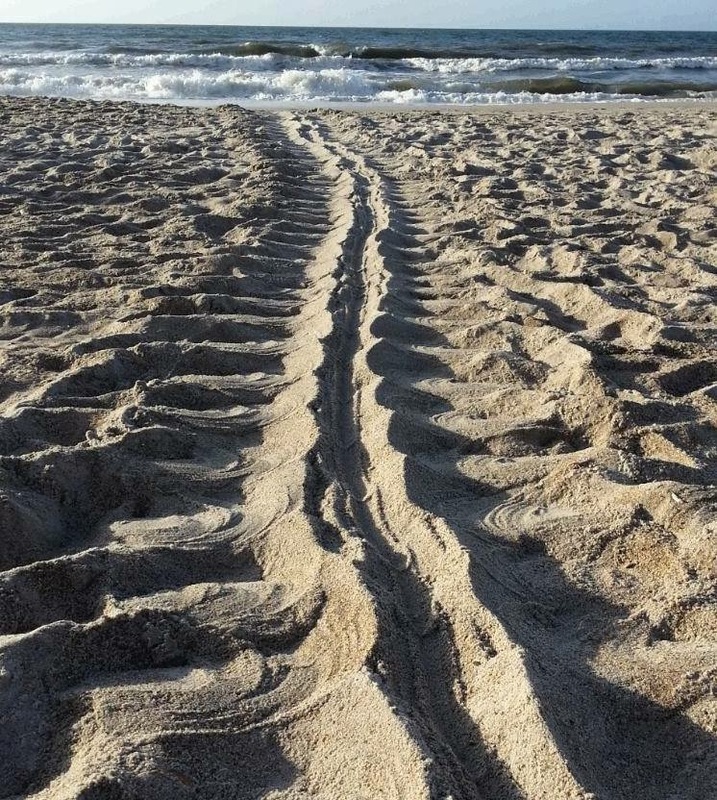 Although May 1st is technically the beginning of nesting season in North Carolina, this doesn’t necessarily mean that we’ll start seeing turtle tracks and nests popping up right away. The season generally starts off pretty slowly, but picks up towards the end of May and is in full-swing by the beginning of June. One of the most magical things you could ever experience is seeing a nesting sea turtle. In this area, the sea turtles laying eggs are almost exclusively loggerheads, which nest at night. 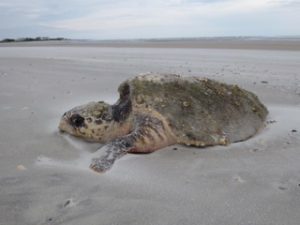 On more rare occasions, you may see a green, Kemp’s Ridley, or even a leatherback. But remember – only Kemp’s Ridleys nest on the beach during the day. All others come ashore at night. As you may already know, sea turtles can easily become confused by light sources from flash lights and houses. If you are staying on the beach and need to have a light on in the house at night, make sure your curtains are thick enough to block out that light, and make sure to turn those porch and patio lights off when the sun goes down. If you need to have a flashlight to take a walk on the beach, make sure it has a red light bulb or has red cellophane over the light. 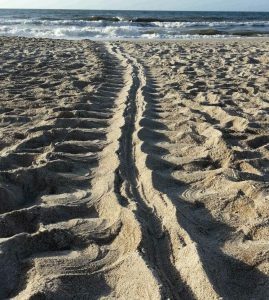 This keeps sea turtles from becoming disoriented and makes their difficult journey as easy as possible. It’s especially important to remember this as nests begin to boil, as hatchlings are particularly sensitive to light and may try to follow the light instead of heading into the ocean. Make sure to give those nests plenty of space! You may walk down the beach and come across a small square of beach marked off with wooden stakes and bright orange tape and wonder what on earth that’s for. It’s a sea turtle nest! Feel free to look, but make sure not to touch. Sea turtles are federally protected species, and so are their nests! Nests with tape around them mean that they have been set up to deter predators, and tampering with them can result in a hefty fine (up to $100,000) and even jail time. Make sure to admire from afar! Join us at Sea Turtle Camp this summer to learn more about nesting season, work hands-on with the turtles at the Sea Turtle Hospital and so much more!